Asus ZenFone Max M2 which bears the model number ASUS_X01AD (ZB633KL) has been certified in NCC, Taiwan’s official certification website. Earlier this month, popular tipster Roland had tweeted about the upcoming Asus Zenfone model variants and their names, along with specifications. He had mentioned that Asus Zenfone Max M2 bears the model number ZB633KL and Max Pro M2 takes ZB631KL. One of these two models appeared in Taiwan’s NCC today with its secondary model number ASUS_X01AD. From last week’s update in Thailand’s certification body NBTC, we got to know that the model numbers ASUS_X01AD and ZB633KL belong to the same model. 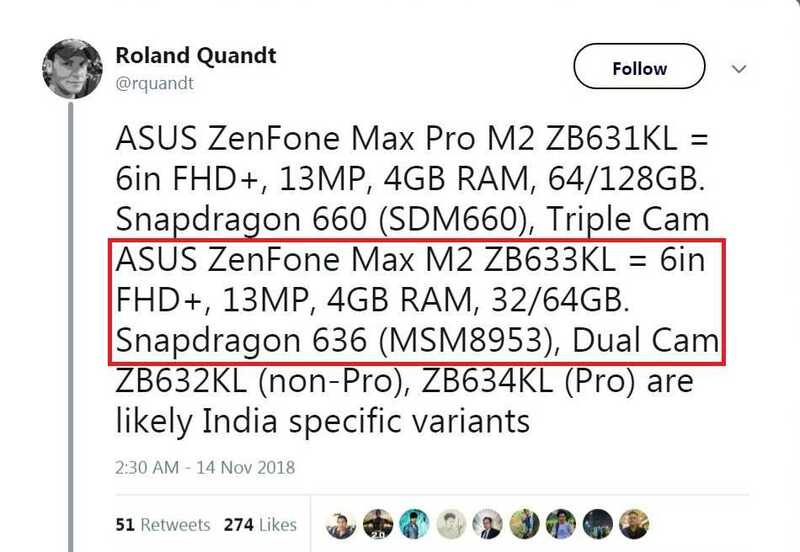 As per this listing and Roland’s tweet, we can conclude that the phone certified in today’s NCC listing is none other than Asus Zenfone Max M2. Not all specifications of the new phone have been revealed, but from whatever is available, it is learnt that the Asus ZenFone Max M2 will sport a 6 inch full HD+ display with a screen resolution of 1080 × 2280 pixels. The screen will be bezel-free with just enough provision for the front camera and sensor. The processor will be the octa core Qualcomm Snapdragon 636 SoC (MSM8953) that clocks a speed of 1.8 GHz. The RAM is likely to be 4GB but a 6GB variant could be made available too. The storage variants could be 64GB and 128GB with the slot for a microSD card to expand the storage by an additional 256GB provided. Rumors indicate the phone could boast of a 5000 mAh battery. Asus Zenfone Max M2 is likely to have a dual camera setup with a 13MP sensor being the primary unit with one more sensor adding to the overall imaging experience. The front camera will host a single lens but its specs are still not clear. There could be in-display fingerprint sensor and the phone is likely to come fitted with the complete suite of sensors and have all the connectivity options too. Surprisingly, the operating system is going to be the stock Android Oreo version 8.1 and no UI over it. This is a departure from the practice followed by most Chinese/Taiwanese manufacturers, but it is learnt Asus has communicated to Google that its ZenFone Max M2 will sport the out of the box version of the OS. Asus has to take on the Chinese major Xiaomi for competition and there are certain price points and specification levels, where it may be able to effectively offer a matching device. The Asus ZenFone Max M2 might be one such product. The results will be known in a matter of weeks. The phone may get released with some minor changes here and there in the other markets too. Asus Zenfone Max Pro M2 with the model numbers ZB631KL and ASUS_X01BD/BDA has got WFA certification today. From the certification, it is evident that Max Pro M2 will ship with Android Oreo 8.1 OS out of the box. Last week Asus tweeted from its official account confirming the release of Max Pro M2 in Indonesia on December 11. This will be followed by the other markets in Asia and elsewhere. It is expected to come with a triple camera setup in the rear plus a host of specifications and features pitting the new device against many mid-segment devices in the market. As for other specifications, it’s pretty much similar to Zenfone Max M2 in most of the specs except for the processor (Snapdragon 660 instead of SDM 636), triple camera and higher internal storage capacity of 64/128 GB.